​Next, you’ll want to add content to your section. 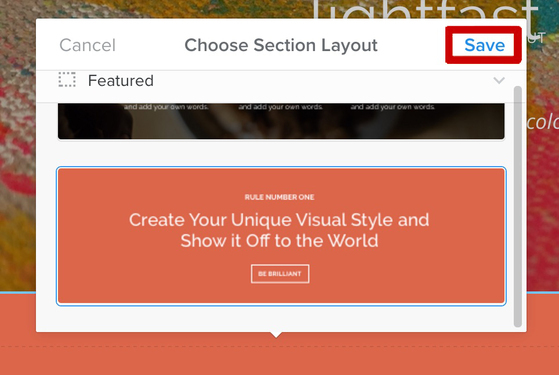 We’ve put together some pre-made, customizable layouts to help you quickly start building great-looking sections. 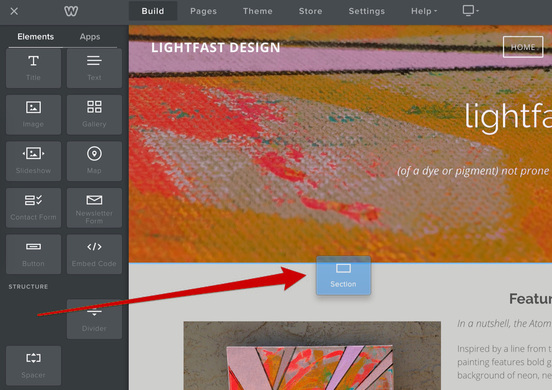 ​Click on any one of the layout styles to see a preview of how it will appear on your page. If you like what you see, go ahead and save. You can then rearrange, add or remove any of the elements in the layout and customize them with your own content. ​Each section on a page can have its own unique background color or image, and you can even add a video background. Click on the section and then on Edit Background. ​For image and video backgrounds, you can upload your own or choose one from our built-in galleries. Background colors can be selected using the Hue slider or by entering the specific hex code for the color you want. ​Want to make a section taller or shorter? Click on it and drag the blue bar at the bottom up or down to adjust the height, which will be displayed in pixels as you move the bar. If the tool tip says “Auto”, that means the section can’t be made any shorter, so you’ll need to remove some elements first. ​You can also change the vertical alignment of all elements in a section by clicking on Edit Background, and then Advanced. Elements can be aligned to the top, middle, or bottom of a section. ​Need to move or copy a section to another page? Click on the section and then on Move. You can move a section up or down in position on the same page, move it from one page to another, or copy it to a different page or to the same page.